His tutor, realizing he could not provide a true answer to his inquisitive student, said, “I can no longer be your teacher.” He then arranged for the youth to go study with the aged Master Wuxie Lingmo who lived in the region. 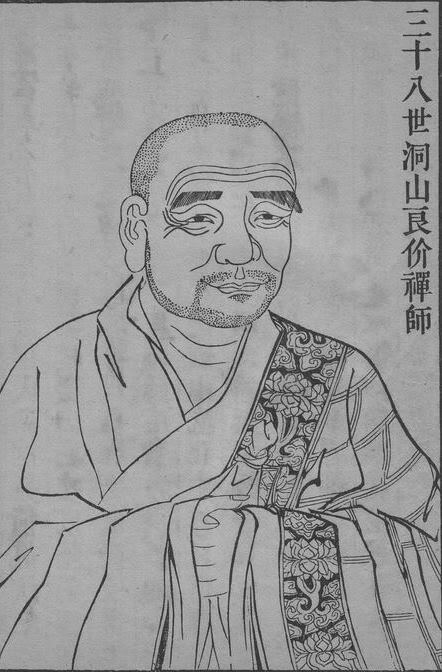 Master Wuxie had been one of the prominent disciples of Great Master Shitou . The youth became a novice under Wuxie, received the name Liangjie, and trained with the master until early adulthood. At the age of twenty-one, Liangjie took full monk's ordination at Shaolin Monastery on Mount Song. He then began to travel in order to meet and study with the many notable masters of his time. The teaching of the non-sentient is beyond conception. If you listen with your ears, you can't understand. When you hear with the eyes, then you'll see directly. “I don't have the eye,” insisted Liangjie. Don't seek after other places, or the self will recede far away. Now I walk alone, yet everywhere I meet it. It's no other than myself, yet “I” am not it. Master Jingzhou clapped his hands. Master Daci then left to take a rest. of the plum blossoms pervade the entire universe? Master Dongshan had a good friend who had been a fellow student with him under Master Yunyan. His name was Sengmi, from Sacred Mountain (Shenshan), and the two would often visit and travel together. “Not a single person has acknowledged me,” replied the master. “Why hasn't anyone acknowledged you,” asked the monk. The master then returned to his room, sat upright, and passed away. .
Cf. Original Teachings of Ch'an Buddhism. Translated by Chang Chung-yuan. New York: Random House, 1969. pp. 58-70. Taipei : The National War College in co-operation with The Committee on the Compilation of the Chinese Library, 1967, pp. 171-190. Tung-shan was born into a Yü family of Kuei-chi in present Chekiang. In his tender years he joined a Buddhist monastery as a novice. The master taught him to recite the Pan-jo Hsin- ching (Prajna-hridaya Sutra); but when he came to the sentence: “There is no eye, ear, nose, tongue, body or mind,” he suddenly put his hand on his face and asked his master, “I do have eyes, ears, nose, tongue and so forth; how, then, can the Sutra say that there are no such things?” The master was amazed by this unexpected question and began to marvel at the boy’s matter-of-factness. He was professed in his early twenties. As usual, his profession was followed by a period of journeying to different centers of Buddhist learning and calling on different masters for their instructions. The first one whom Tung-shan visited was Nanch’üan, the beloved disciple of the late Ma-tsu. The visit happened to fall on the eve of an anniversary of Ma-tsu’s decease. In a regular gathering, Nan-ch’üan asked his monks, “Tomorrow we are going to make offerings to Ma-tsu. I wonder if Ma-tsu will come. What do you think?” The whole community remained silent. Only Tung-shan came forward and said, “He will come as soon as he finds his companion.” Profoundly impressed by the young visitor, Nan-ch’üan remarked, “Although this man is still a youth, he is excellent material to carve and polish.” “Let not the Venerable Abbot,” said Tungshan, “debase a free man into a slave!” Here again he showed his spirit of independence, and, besides, some idea of the inner self, which cannot be carved and needs no polishing. Will you really know it. Yün-yen asked him, “Are you happy now?” His answer shows his usual candor: “I do not say that I am not happy, but my happiness is like that of someone who has picked up a bright pearl from a heap of garbage.” The bright pearl referred, of course, to the new insight; as to the heap of garbage, very probably he had in mind the remnants of old habits which, as he confessed, were still in him. Can there be a true union with the Self-So. Clearly there is a subtle distinction between the “I” and the “He.” He is I, but I am not He. This is like saying that God is more myself than myself, although I am not God. There is the same relation between the “I” and the “He” as between Atman and Brahman, and between the True Man of Tao and Eternal Tao. How limpid the autumn waters, and with no bottom. In this gatha you see still the same old independent and matter-of-fact Tung-shan with his vision lifted to a new height. He is alone and yet in company. He has attained Oneness, yet it is a Oneness not unrelieved by a refreshing diversity. His ethereal vision does not prevent him from walking on the solid ground. And his contemplation of the Eternal Self-So has led him back to the here and now. Oh, how wonderful, how wonderful! The ineffable realms of Buddha and Tao! This was a quotation from the Book of Chuang Tzu. It is remarkable that Tung-shan should have introduced a quotation from Chuang Tzu. This bespeaks his catholicity, and reveals the close affinity between Ch’an and Tao. Around 860, when he was in his early fifties he became an Abbot on Tung-shan Mountain in present Chiang-hsi. (Like so many other cases he has been called by the name of the mountain where he taught.) On an anniversary of Yün-yen’s decease, a monk asked Tung-shan, “Abbot, when you were with Yün-yen, what particular instructions and directions did you receive from him?” Tung-shan replied, “Although I was in his community, he neither directed nor instructed me.” “This being the case,” asked the monk, “why do you make offerings to him?” “Well,” said the Abbot, “I revere my late master not for his virtue and learning, but because he did not break the secret to me.” Then the monk asked him whether he agreed with all the teachings of his late master. “I accept half and reject half,” the Abbot replied. “Why not accept the whole?” the monk asked, and the Abbot explained, “If I did, I should be unworthy of my late master.” Evidently, his growing age had not lessened his spirit of independence. In fact, it was a part of Ch’an traditions that a disciple must prove smarter than his master before the latter could transmit the lamp to him. When a monk asked, “In cold days and hot days, where can we betake ourselves to avoid the coldness or the heat?” the Abbot asked back, “Why don’t you go to a place where there is neither coldness nor heat?” “What kind of place is it?” “When it is cold, you are frozen to death. When it is hot, you are roasted to death.” This dialogue serves to show what a patient and subtle teacher Tung-shan was. In his hands, even a silly question could be turned into a spring-board for the ocean of mystical wisdom. Tung-shan was equable in temper, never resorting to shouts or beatings. Nor did he resort to the mind-teasing kung-ans. His dialogues are simple yet profound. They are like olives: the more you chew at them the better they taste. For instance, a monk asked him whether it was true that the late master Yün-yen had once said, “Just this one is.” The Abbot answered, “Yes.” “Do you believe that he knew that there is?” asked the monk again. The Abbot replied, “If he did not know that there is, how could he speak of it as he did? If, on the other hand, he knew that there is, why did he force himself to speak of it at all?”1 “This one” of course refers to the true Self, and “there is” (in Chinese, yu) is a common expression in Ch’an literature, to designate Pure Being or Reality. Strictly speaking, neither the true Self nor Pure Being could be expressed in words. On the one hand, one is aware that the true Self or Pure Being is; on the other hand, it is essentially inexpressible in words, and even the phrase “this one” is already an intruder. This, I imagine, is what Tung-shan meant to suggest to the mind of his questioner. But being a great master of the Ch’an pedagogy, he refrained from stating his views plainly, and resorted to the use of questions in order to stimulate his pupil to think and find the answer for himself. One answer that a student finds for himself is worth more than a hundred answers hammered into his head by a teacher. Anyone who deals with the teachings of Tung-shan and his House will soon notice the doctrine of the “five positions of prince and minister.” This doctrine and others like it are not of central importance in the teaching of Tung-shan’s school. They are merely expedient means or pedagogical schemata for the guidance of the less intelligent students. It is regrettable that historians of Ch’an have a tendency to treat these incidentals as essentials and to ignore the true essentials altogether. With this necessary reminder, let me give a brief account of the doctrine of “five positions.” (In fact, there are various ways of formulating them. Tung-shan has one way, while Ts’ao-shan has another. )2 As Tung-shan presented them, the five positions are (1) The noumenal hidden under the phenomenal; (2) the phenomenal pointing to the noumenal; (3) the noumenal entering consciously into the phenomenal; (4) the two arriving at a harmony; (5) reaching the heart of the harmony. These five positions were meant to indicate the progressive stages or degrees of spiritual life and enlightenment. In the first stage, the student is more or less unaware of the noumenal in him, and directs his attention to the phenomenal. Instead of being the host that he virtually is, he remains a guest. But as in reality the noumenal and the phenomenal form a continuous whole or, in the words of Lao Tzu, a mysterious identity, even a one-sided attention to the phenomenal and a serious study of its laws and interrelations may turn out to be a useful preparation for soaring into the heights and diving into the depths. Besides, no one can study the phenomenal for long without becoming gradually aware of the part that his mind plays and contributes. The discovery of the subjective element in the objective is the beginning of self-discovery. So, too, on the moral plane, one begins by behaving conformably to the prevailing customs of his community, regarding them as sacred and universally applicable to all men everywhere. But as he grows in experience he comes to discover that the familiar is not necessarily right, nor the unfamiliar necessarily wrong. Bewildered for a moment by the phenomenon of conflicting moral standards, he is inevitably driven to turn inwards to himself and to seek guidance in reason and conscience. In this way, he becomes more and more aware that essentially he is a free man rather than a slave. But on all planes, the old habits die hard. The noumenal hidden under the phenomenal! It is little wonder if you fail to recognize the person you meet. Dimly, dimly, you approach him as a stranger with your habitual suspiciousness. The Phenomenal moving to the noumenal! Clearly and distinctly her own face, so different from all the images she had formed of herself! And grasp at its mere shadows. In a cloud of dust, he follows a secret road beyond the reach of dust. He excels in keeping unsaid things tabooed at present. Yet he says more than the most eloquent tongues of the past. In other words, coming from the noumenal, he realizes how impossible it is to convey in words things he has personally experienced and intimately known to persons who are still in the first stage, and how misleading it would be to them if he were to offer them some neat and easily memorized formulas in lieu of the real thing. This is why the Ch’an masters have mostly followed the via negativa and an esoteric approach far from the beaten track. Sometimes, they resort to interesting parables and very original and striking figures of speech. Even shouts and beatings and nonsensical answers to sensible questions have been preferred to cut-and-dried definitions and systematic presentations, which would only create an illusion of certainty and lull people to sleep. The Ch’an master, at least the greatest among them, had only one aim in mind: to rouse the dormant potentialities of the pupils, to make them think for themselves and be the men that they are. As to whether they have used the best means, it is another question. The noumenal and the phenomenal coming together! There is no need to avoid their crossed swords! While all the time his heroic wishes pierce beyond the skies. Lo, he has arrived at supreme unity! Who dares to follow the rhymes of his poetry? Let others aspire to the extraordinary! He is happy to return home and sit amidst ashes! “To sit amidst ashes” is to be enveloped in complete darkness. That this should have been put by Tung-shan at the very summit of such a wonderful pilgrimage of the spirit may at first sight appear rather strange, if not disappointing. What an anticlimax it would seem to be! But to anyone who is acquainted with the testimonies of great mystics of the world, it would be surprising if his final finding were different from what he actually found and recorded. Here his remarkable matter-of-fact-ness has stood him in good stead even in the rarefied sphere of high mysticism. He is in the company of Lao Tzu, Chuang Tzu, Plotinus, Meister Eckhart, and John of the Cross. “Knowing yet unknowing is the highest,” Lao Tzu had declared, and all the masters of Dark Truth have echoed him. Tung-shan’s charcoal or ashes is but a symbol of Dark Truth. On another occasion, he referred to it in these words: “Something there is: it is the prop of the sky above and the earth below, it is black like lacquer; it is perpetually in movement and activity.” This sounds like a riddle. Actually, it is more than a riddle, it is none other than Tao, the Mystery of Mysteries. Tung-shan has given us another somewhat different sketch of the five stages, under a new set of names: (1) hsiang, or admiration, attraction or aspiration, (2) feng, or willing submission, (3) kung, or fruition, (4) k’ung kung, or multiple fruition, and (5) kung kung, or the fruition of fruition. Evidently, this was a chart for the spiritual direction of his disciples. Who treated his people with respect and humility. He was hailed by all his people for his benevolent government. In the political world, this would be the peak of achievement. But in the spiritual order, this is but the beginning, the initial attraction. In the thickets of wood among the jagged peaks. This stanza needs a little annotation. In the first line we find the novice already started on the life-long job of living, of being himself. He has cleansed himself of all his colorful adornments. For whom has he done it? His answer is found in the second line: He has done so certainly not because the master has praised him, but simply because a mysterious voice has been urging him to return home. This mysterious voice is symbolized by the cuckoo’s cry. In the poetical lore of China, the cuckoo’s note sounds like ch’ui kuei, or “time to return home,” so that on hearing it the wanderer becomes homesick. But whose voice is it? It might be the voice of a brother, a sister, a lover, a friend, or even a parent. Anyway, it is the voice of someone very intimate to you, who has a selfless concern about you, warning you against your aimless wanderings which, to put it moderately, can lead you nowhere. It is not a stern voice speaking categorically, but a gentle voice like the refreshing breeze in a hot summer day. It is all the more irresistible for its tenderness. But whose voice is it? The disciple in this stage, however, is more interested in the message than in the messenger. He is still in the “faith stage,” not yet in the “personality stage.” The message is the call to return home. But monks have called themselves “home-leavers.” Is the cuckoo calling them to return to the homes they have left? That’s impossible. Then where is the home the voice is calling them to return to? The home is within you. Recollection is the beginning of the interior life. In the last two lines, the veteran master is telling the novices they are not the only wanderers who need to be reminded of the home, for, in a sense, even the most advanced in the life of the spirit are still on the way. This prospect does not make the novice falter: rather, it consoles him by making him realize that in his journey home he is not alone but in good company. The withered tree flowers into a new spring far, far away from Time’s kingdom. The hunter of the unicorn rides backwards on a jade-white elephant. Where clear moon and pure breeze fill him with happy days. This scene is too beautiful and quiet! Any comment on my part would only soil it. Only the second line needs a little elucidation. The jade-white elephant symbolizes the Tao in motion and operation. The unicorn is the Tao as the ultimate goal. Now the pursuer of Tao has entered on the path of fruitful passivity, letting the Tao direct the course instead of trying to direct the course of Tao. The “reverse ride” evokes the idea of a childlike trustfulness, which is the soul of the passive way. There is no conflict between the Buddhas and all the living beings. The mountains are of themselves high as waters of themselves are low. All distinctions in kind or in degree—what do they prove? Wherever the partridge cries, flowers are blooming afresh! This stanza may be called a poetic epitome of Chuang Tzu’s marvelous essay on “The Levelling of All Things.” Tung-shan has elsewhere declared, “Only he who knows that there is a Man beyond Buddha can participate in this discourse.” When a monk asked him who that “Buddha-transcending Man” is, the master answered, “not Buddha,” In the eyes of that Man, there could be no important difference between all the Buddhas and other beings. This is the message of the first line. In the second line, the keynote is in the words “of themselves.” It is none of your business that the mountains are high and the waters are deep. You are not called upon to interfere with their intrinsic qualities. You are not even warranted in passing judgment upon them or making any discriminations between them. Who are you to judge another’s servants? Or rather, what entitles you to turn subjects into objects of your judgment? Do not render to another what you would not like to have rendered to yourself. But since you are now free of discriminating tendencies and habits, you are like the partridge which calls all kinds of flowers into blooming afresh. As soon as your antennae begin to stir, it is already an intolerable misery. The slightest intention to pursue Buddahood is a cause for shame. That which journeyed South visiting fifty-three enlightened ones. What an agonizing ideal of perfection is here presented! Even the hardly felt first motions of self-complacency and selfseeking are to be nipped in the bud. However, the tension of the first couplet is relieved in the second couplet. If we do not have a clear and intimate knowledge of our true Self, we can console ourselves with the fact that nobody else since the beginning of time has actually known him. Or perhaps he does not stand in front of us to be an object of our knowledge? Then he is not for us to know but for us to be. In this connection, let me quote what Thomas Merton has written on Chuang Tzu. “Chuang Tzu,” he writes, “looked on life as a whole—and as a mystery—that could not be grasped merely in a clear doctrine, with logical explanations of the ways things are, implemented by orderly social customs and patterns of behavior. He reached out for something more, something which could not be expressed, and yet could be lived: the ineffable Tao.” As Tung-shan was in the lineage of Shih-t’ou, whose affinity with Chuang Tzu is well-known, it is little wonder that these words from Merton on Chuang Tzu seem to fit Tung-shan so well. That you may appear as a stupid and dull-witted man. From this you can see what a practical and shrewd teacher Tung-shan was! Not only the mystical insights of Lao Tzu but also his practical roguishness seems to run in the blood of this great master of Ch’an! Superficially, his constant recurrence to the five stages of spiritual life might seem to run counter to the spirit of his great ancestor Ch’ing-yüan, who had no use for “stages and degrees.” Yet, we should remember that in the hands of Tung-shan they were avowedly used as expedients of teaching. So long as they are regarded as temporary devices, they have their proper place in eternal Reality. It is only when they are mistaken for eternal categories that they become as obtrusive as a sore finger. Tung-shan was above all a great teacher with his attention wholly on the needs of his disciples. He remained a selfless teacher up to the very end of his earthly life. The scene of his last days is most touching. Sometime in the spring of the year 869, he fell sick. A monk asked him, “While you are sick, is there still someone who is never sick?” He replied, “There is.” “Does the never-sick one look at you?” “Rather it is for this old monk to look at him.” “How do you look at him?” “When this old monk is looking, I see no sickness anywhere.” This was a Ch’anish way of saying that the never-sick one is none other than his true self. To put it in another way, only his Nirmanakaya or transformation form is sick, while his Dharmakaya remains healthy and whole, and, being unborn, cannot die. When he felt it was time for him to go, he had his head shaved, took a bath, put on his robe, rang the bell to bid farewell to the community, and sat up till he breathed no more. To all appearances he had died. Thereupon the whole community burst out crying grievously as little children do at the death of their mother. Suddenly, the master opened his eyes and said to the weeping monks, “We leavers of homes are supposed to be detached from all things transitory. In this consists true spiritual life. To live is to work, to die is to rest. What is the use of grieving and moaning?” He then ordered a “stupidity-purifying meal” for the whole community. Sensing that their beloved master meant to leave them after that liturgical meal, they were not in a particular hurry to eat it. So they took seven days to prepare it. The master participated in the meal with them. After the meal, he said to them, “Please make no fuss over me! Be calm, as befitting a family of monks! Generally speaking, when anyone is at the point of going, he has no use for noise and commotion.” Thereupon he returned to the Abbot’s room, where he sat up as in meditation till he passed away. It is interesting to see how he kept his spirit of independence and matter-of-factness right up to the end. 1) In order to understand the real meaning of this word, let the reader study another passage: He said to his community, “Only he who knows the Person beyond and above the Buddhas can participate in this discourse.” A monk asked, “Who is the Person beyond and above the Buddhas? “He is not a Buddha,” the master replied. 2) Ts’ao-shan states the five positions are as follows: (1) center signifies the Void; (2) peripherysignifies the phenomenal world; (3) the central covered by the peripheral signifies turning one’s back to the Principle in pursuit of empirical facts; (4) The central revealed through the peripheral signifies leaving the realm of empirical facts to return to the center; and (5) center and periphery united signifies responding invisibly to all situations without falling into any, transcending contamination and purity, the central and the peripheral. This is called the great Tao of the ineffable Void, the true school of NonAttachment. 3) The translation here is borrowed from Lu K’uan Yü, Ch’an and Zen Teaching, First Series (London, 1961), p. 152. 4) Literally, it means: “True eternity never ceases to flow and permeate.” But the translation in the text, taken from Lu, ibid., p. 152, cannot be improved. Tung-shan had the fruit tray removed. Yun-chu returned to his hut and sat in complete silence and stillness, so the angel couldn’t find him. After three days like this, the angel disappeared. Don’t seek fame or fortune, glory or prosperity. Just pass this life as is, according to circumstances. When the breath is gone, who is in charge? After the death of the body, there is only an empty name. When your clothes are worn, repair them over and over; when you have no food, work to provide. How long can a phantomlike body last? Would you increase your ignorance for the sake of its idle concerns? The absolute state is relative; when it is discerned in the relative, this is fulfillment of both meanings. The fact that the absolute state is relative is because it is not the opposite of any thing. But even though it is not the opposite of any thing, nevertheless it is there. What is “total”? One who does not look back is one who has attained. The absolute state does not come from illumination: it is so whether or not a buddha emerges in the world. That is why all sages resort to the absolute state to attain realization. The relative within the absolute is inherent in this state; above all, don’t cause disturbance. When students choose solitary liberation outside things and stand up before the sages and declare that this is the absolute state, ultimately complete, in reality they are limiting the absolute state. Sayings like this are what the ancients referred to as the traces of passing still remaining. They have not yet attained the unspoken within the spoken. It is said, furthermore, that this is not the absolute state, because there is something said in the words. This could be called defective integration; it cannot be called mutual integration. The relative state, though relative, still fulfills both meanings; discerned within conditions, this is the unspoken within the spoken. This is because no aim is defined in function; when no aim is defined, that means it is really not fixed function. The relative state, though relative, still fulfills both meanings in that there is no thing and no attachment in the function; this is both meanings. Although it is clarified in function, because it is not done violence in speech, here one can speak all day and yet it is as if one had not spoken. The relative state is actually complete; this also involves being unattached in the midst of conditions. There may be emergence in the absolute; this is the spoken within the unspoken. Emergence in the absolute does not take in conditions; this is like Yao-shan’s saying, “I have a statement that has never been spoken to anyone.” Tao-wu said, “They come along together.” Here he understood subtly. There are many examples like this. Things must come forth in combination, without confusion of noble and base. This is called the spoken within the unspoken. Also, in reference to “I have a statement that has never been spoken to anyone,” when those who engage in dialogue come forth, they must avoid rejection and attachment; both rejection and attachment are due to ignorance of what’s there. The unspoken within statements does not define nobility, does not fall into left and right; therefore it is called emergence in the absolute. Emergence in the absolute makes it clear that the absolute is not involved in conditions. To cite more sayings, it is like “How is it when the black bean has not sprouted?” or “There is some-one who does not breathe” or “Before conception, is there anything to say?” This is where the buddhas of the ten directions emerge. These examples are referred to as speaking of the unspoken. There is also borrowing phenomena for temporary use. In the state of emergence within the absolute, the one who responds must clarify the comprehension of things within the relative; one cannot clarify it while plunged into the absolute state. In these examples, though recognition is attained within conditional objects, it is not the same as the past, when mastery had not been attained. Later people may have relegated this to cultivated development, considering that to be the transcendental. For example, students pick out this saying in answer to a question about the meaning of the founder of Zen—“I’ll tell you when a lone cow gives birth to a calf”—and say that this is emergence within the absolute state. This kind of saying cannot under any circumstances be considered emergence within the absolute. It could be called dialogue on the mystic path; it’s the same thing—this is a particular path. It cannot be called integration either, because it is obvious; even if guest and host interact, it can only be called defective integration. There may be emergence within the relative; this is the unspoken within the spoken. Emergence within the relative includes conditions, as in the saying “What can we call that which is right now?” As there was no answer, Tung-shan himself said, “Cannot but get it.” There are many more such examples; this is referred to as the unspoken within the spoken. Speech comes from elements, sound and flesh, which do not define place or direction, right or wrong. That is why it is said to be understood in relational context. This is emergence within the relative. There are many corresponding sayings. For example, “What has come thus?” And, “When mind and objects are both forgotten, then what is this?” Also, “When concentration and insight are learned equally, you clearly see the buddha nature.” These examples too, of which there are many, are referred to as the unspoken within the spoken. Emergence within the relative is clarifying the essence within things, as in the saying “What has come thus?” and “When mind and objects are both forgotten, then what is this?” This category of saying refers to achievement to clarify state, illustrating the state in terms of the work. Here too I used to cite corresponding examples. “What has come thus?” is one example of a saying: although it is recognized within conditions, in relational context, that is not the same as before. Also, with the example of “‘When concentration and insight are learned equally, you clearly see buddha nature’—what is this principle?” at first I would cite corresponding sayings. As for the saying “When mind and objects are both forgotten, then what is this?”—because this is an example from among the doctrines, it is not the same as mystical study. What one must do, in dealing with doctrinal examples, is to go through them into the gateway of the source. This is the exoteric side of mysticism. In the case of the saying “Breathing out, I do not depend on conditions; breathing in, I do not abide in mental or material elements,” this is all about work; it is not the same as recognition within conditions. Here too I used to cite corresponding examples of the host withdrawing into the absolute, saying, “There is someone who has no outgoing or incoming breath,” to get others to know of the absolute. There is, furthermore, an ultimate state of immaculate purity that includes work, which may also be called emergence within the relative. This is hard to discern; it must be picked out. For example, a monk asked Tung-shan, “What is the mystic teaching?” Tung-shan replied, “Like the tongue of a dead man.” Another asked, “What is presented as an offering twenty-four hours a day?” He said, “No thing.” This is said to be emergence within the relative, but these two examples are not to be called emergence within the relative state. It is necessary to distinguish them individually. The saying about the “mystic teaching” could be considered the same as work and achievement, but neither saying can be referred to as the relative or as integration. It has already been made quite clear. This is using the work to illustrate the state; using the state to illustrate the work is the same as this. There may be mutual integration: here we do not say there is the spoken or the unspoken. Here we must simply proceed directly. Here it is necessary to be peifectly fluid; things must be perfectly fluid. With mutual integration, the force of words is neither relative nor absolute, implying neither being nor nonbeing, so they seem complete without being complete and seem lacking without lacking. One can only proceed directly; proceeding means we do not set up a goal. When they do not define a goal, words are at their most subtle. The incompleteness of the scene is a matter of ordinary sense. However, words on the Way are all defective; people must master spoken expressions and proceed directly ahead. The spoken is coming thus; the unspoken is going thus. Among adepts, it is not that there is no speech, but it does not get into the spoken or the unspoken. This is called integrated speech. Integrated speech has no obvious aim at all. Integration does not fall into the spoken or the unspoken, as in Yao-shan’s saying on wearing a sword, which is an integrated saying. Observe the force of the words at the moment: sometimes it is immediate and direct, and sometimes it is emptiness within differentiation. If you do not understand this subtly, you are far, far away. To cite examples of integrated sayings, there is the saying of Wen-shu about drinking tea, and also the saying, “Where is this man gone right now?” Yun-yen said, “So what? So what?” He also said, “How about right now?” There are very many such examples. There is also integration within work and achievement, which resembles the transcendental. It is dealt with according to the situation: for example, if you get trapped in a state of pure ethereality, then you have to realize that there are still things happening; go when you need to go, stop when you need to stop. Adapting fluidly in countless ways, do not be crude. Now then, the forces of the words of both the one who questions and the one who replies respond to each other. None is beyond the scope of the Five Ranks. Words can be coarse or fine, however, and answers may be shallow or deep. That is why Tung-shan articulated what is not in words; in every case this was considered a necessity in response to conditions, that is all. “People of great ignorance,” being complete in essence, are not the same as “incorrigibles.” “Incorrigibles” suffer mentally when they know there is something to do; yet even though they suffer mentally, they accomplish service. To suffer mentally means not to keep thinking of Zen masters, buddhas, or one’s own father and mother. “Rotten people” do not resort to total burden-bearing, so they do not set up any idol. “People of great conservation” have got their feet stuck deeply in the mud, so maintaining their discipline is not a small matter. Integration in the darkness uses work to illuminate things, and uses things to illuminate work; it uses errors to illustrate accomplishments, and uses accomplishments to illustrate errors, equally in this way. Whatever Yao-shan, Tung-shan, and all the other worthies produced that went beyond into the absolute were just marvelous expressions of mystic conversation, that is all. When they subsequently came to those who had attained a little power, they drew them into the absolute, in which context this type of saying is commonly used. Because I have so much to do, I haven’t had the time to go into details, and have only explained a little bit. You should not slight this; if you still get frozen or stuck anywhere, you should cut through to certainty then and there. You should practice diligently, so that this thing will never be allowed to die out. Don’t reveal it carelessly, but if you meet someone who is pure and simple, who is an extraordinary vessel, then it is not to be concealed.